Arachne | Learn about Greek Mythology,Greek gods,Greek mythology stories! Arachne(gr.spider) sitting in front of her loom,was weaving magnificent designs with lustrous threads.While working she was smiling and singing a cheerful song.All the people from her village and the surrounding villages came to see the wonderful wefts which the young lady made. The praises that she heard about her skill,made her happy but also made her very cocky. One day she braged to an old lady by saying "I can weave even better than goddess Athena". "Hush! !The goddess might hear you",whispered the old lady. "I dont care! ",Arachne said loudly. Everyone knew that it was very dangerous to talk that way about the gods and the goddesses.If they heard something they didnt like,they could play dangerous games with people. At that moment,in front of the door at the Arachne's house,Athena showed up.Arachne flnched and kneel infront of the weaving goddess.But her look was still full of pride. "I think i heard you mention my name and i came to see your wefts",said Athena.A smile was painted at her face,but the tone of her voice was icy.Anyone who would hear her would run scared far away. 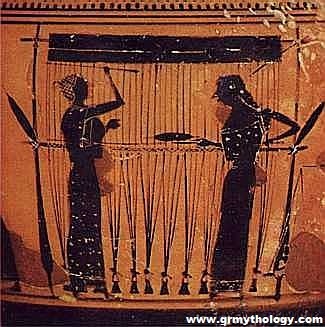 Athena looked the weft which was lying on the loom and said"Yes,i admit it is very good!" "Can you weave better?" Arachne dared to asked. "We will see",replied the goddess. "We will compete,you and me and we will see". 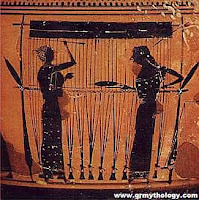 Athena and Arachne at on their looms and weaved for many days.They used the most lustrous threads and created original designs.When they finished,they took the wefts and lay them on the ground next to each other.Everybody came to see and admire them and try to distinguish which one was better. Athena stook and looked silent.Both were the same gorgeous.The weft of Athena,depicted the gods punishing the people who didnt show respect,while the weft of Arachne howed the gods with their meanness and their weaknesses and was making fun of them.That provoked the goddess and made her very angry.Outraged she shouted "If you can weave so good,i will make you weave continuously.But the wefts you will make,will not ever anybody want!". She pushed Arachne slightly and threw her on the ground,she shrank and became a tiny little thing with eight legs,which run away and hide in a dark corner.The goddess had transformed her into a spider. Since then spider and her descendants weave wonderful nets.You can see them hanging at the dark corners or if you wake up,you can see them shining in the morning dew.